Interview with Patrick Leder of Leder Games, Allegiance Review, and More! Hey everyone! Busy week here at TCbH HQ! 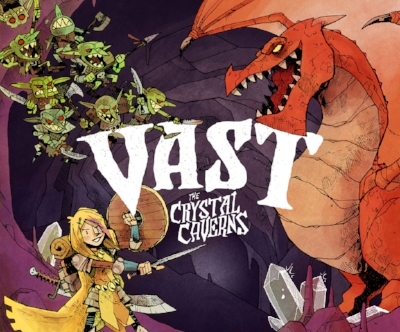 I'm so proud to post my interview with Patrick Leder, co-designer of Vast: The Crystal Caverns and founder of Leder Games. You can still back the 2nd printing of Vast right now, check out the interview on iTunes, Stitcher, or our podcasts tab, then check out their Kickstarter page! That's right, a brand spanking new review for a new twist on a classic setup. And what's more, this review ain't written by me! John L S Foster is a new contributor to The Cardboard Herald. He applies an awesome narrative flair in his writing, I think he's just what we need to spice up the site. As always we want to provide you with diverse opinions and voices, it keeps us honest and keeps you entertained. Yeah, so you guys are incredible and the support for the interviews on TCbH has been amazing, and people are lining up to do interviews at the moment. So instead of the original plan, always changing up the topic of each podcast, we are going to focus on interviews and discussions at the moment. We'll still have some review diary episodes and topic discussions in the future, but those may also be combined into smaller segments of the interview podcasts. Ultimately, we are figuring it out as we go along. One thing we want to continue with is answering your questions. Send them in! We're doing this for you, after all. cardboardherald@gmail.com or @cardboardherald on twitter.